Thought I'd get one more post about the goings- on around here before C-day in 4 days! 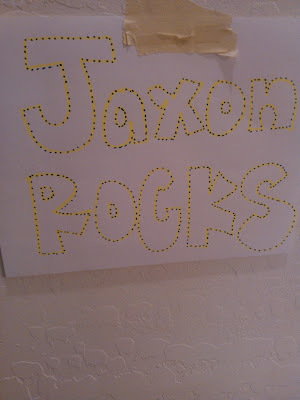 Last Wednesday night Jaxon woke up and was out of bed 4 times! Each time he was completely incoherent, so it was hard to decifer exactly what the problem was. The very last time he finally spoke and said, "His cheek hurt" so Dave gave him some Tylenol and a q-tip with listerine and he slept the last final hours before school. When he got up for the morning he didn't even remember that he had been up or that his cheek had hurt, so we figured it was just nightmares/worries waking him up and moved past it. Thursday on the way to school he started crying and said his tooth hurt, so I figured that was actually the source of the problem, an I called to make him a dentist apt. The only apt. they had before the weekend was Friday morning at 9:30 which is completely awful time. Not really enough time to take him to school in the morning and have him have any appreciable amount of time, but late enough that after waiting at the dentist he might not make it back even before lunch! AHHHHH!!! Thursday after school he didn't complain at all, and thursday night, not wanting a night like before we gave him some motrin just in case. Since he didnt' wake up all night or complain, I rescheduled his dentist apt. for the following week so he wouldn't have to miss school. Friday no problems but Friday night we didn't give him any meds to go to bed and he was up 3 times crying about his tooth. At this point it was Saturday morning and our dentist was closed for the weekend (and I was kicking myself for not keeping his Friday apt) so we just kept him on a Ibuprofin/Tylenol loop and just hoped for the best until he could get to his apt on Monday. Saturday night he was up basically all night hysterical about his hurt tooth, and even the meds weren't helping. Sunday morning we were exhausted and desperate, so after a long and frustrating Google search, I found a dentist in Scottsdale that would come in for emergencies. I called and he came in for us. Turns out Jaxon needed a root canal and had a pretty bad infection in one of his teeth, so one root canal, a round of Antibiotics, and $565 dollars later, we had a happy boy back on our hands. Jax is always a little loopy after laughing gas, so we decided he and I would stay home from Church and watch some Veggie tales. In the meantime of all this, I was feeling pretty crummy. Cramps, backache, and just overall weird and more uncomfortable than usual. Although I didn't feel well, I was hoping it meant that maybe Cooper had decided to join us a little early. No such luck! Monday I had my last Drs apt. before C-day and this time I was dilated "Barely to a 1" So Mr. Cooper is Just like baby Jaxon- determined to stay as long as possible INSIDE the womb. We got things all squared away for my c-section, and that was that. Tuesday I worked for quite a while at Jaxon's school just helping out and trying to stay busy and then had dinner with my dear friend Laura. About 3 in the afternoon I started sneezing and got really stuffed up and could NOT figure out what in the heck I could be allergic to so suddenly! Tuesday night I maybe slept 2 hours I felt so awful. Sneezy, stuffy, headache, earaches, couch, sore throat- you name it! Wednesday morning I don't think I remember ever feeling so awful in my recent history. I stayed in bed until it was time to take J to school, and as soon as he was dropped up came straight home to bed. At noon I dragged myself upstairs to the couch were I laid until Jaxon got home around 3:15 (bless Dave's heart, he left work and picked J up so I wouldn't have to go out again!) K sluggishing, crankily, and very sickly helped J with his homework, and then G & G, being the lifesavers that they are, took him to see his cousins and have dinner out. What a blessing. I slept the whole time they were gone. Dave got home soon after G, G, and J, and took over from there. I still laid on the couch teh rest of the evening and finally went to bed early around 9:30. Armed with my cough drops, extra strength tylenol, and ear drops, I slept like a baby through the night, and though I don't feel back to 100%, I feel SO MUCH BETTER than yesterday. I'm still congested, stuffy, and coughing, but am up and around! Amber came over this morning with Brennen and Baby Koda and I got lots of snuggle time with the babe! He is so tiny, and cute, and good, and THAT HEAD OF BLACK HAIR!!!! AHHHHH BEAUTIFUL!!!!!! Makes me so anxious to hold my baby boy. I'm having a hard time imagining what he will even look like, because between mine and Dave's gene's, the possibilities are pretty much endless! I would love to look back at Jaxon's brand new baby pictures, but they are all packed! I do remember that he was born with a pretty full head of black hair and olive skin, so we thought he would look just like me. He quickly lost all the black hair and grew in blond, lost all of his olive color, and his eyes definately were blue, and we thought he would look just like Dave! Then he lost all of his blond hair and grew in brown, his skin got a little more color, and his eyes turned green! Now he is a good mix of both of us! That's right little buddy, no ankles left on mom. 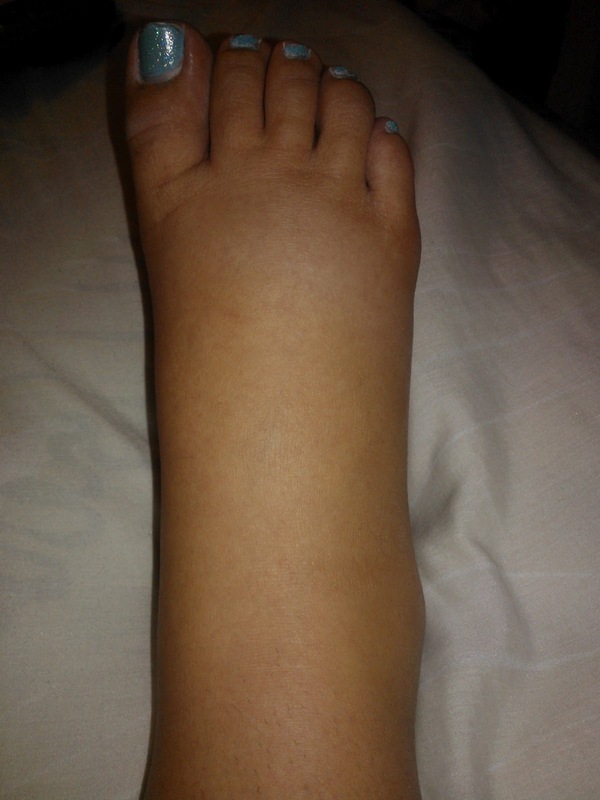 My feet look like sausages and I can barely bend my toes. Not that you aren't worth it, I'm just saying, this is a labor of love!! During the latter half of my pregnancy, I was off the zofran pump and the home IV. I am still pretty nauseated all the time, and throw up at least 3-4 times a day. The nice part is that during the second half of the pregnancy, once I threw up, I usually felt a little better for the next few hours, until I had to eat again. After about week 18 I gave up teaching at the gym. I taught through week 9, then was IV'd and zofran pumped and just couldn't do it without throwing up behind stage between songs. I came back at about 15 weeks when I was off both of those things, and was able to teach most of a class without throwing up back stage (usually just once...) but would feel so absolutely terrible that I would have to be in bed all day terrible sick, dehydrated, headache, etc. I realized that I would just have to take a break from teaching (Something that I really loved dearly) and it was making me pretty sad. I told Daddy that I was really bummed because I had "Really wanted to be one of those ladies who teaches right up into she is about to deliver." Dad got a funny look on his face and said, "No you haven't. You've always wanted to have another baby and give Jaxon a sibling, so let's just be grateful for that!" You know what? HE WAS TOTALLY RIGHT!!! The decision was easy and I gave up my class and the classes I was teaming. It was a pretty easy move, and while I have missed it, I have never regretted it or second guessed my choice! As you have gotten bigger...probably from about 22 weeks on, you have been my little karate gymnist! I'm not sure what that means exactly, because Jaxon did NOT move very much in the womb, and his moves were pretty gentle, but once out of my belly he has been on the move DOUBLE TIME ever since! You Cooper, you move 24-7! And I mean in! You often wake up me at night, and cause me to yelp right out loud, even in public! You flip and pump and turn and push, often several times in succession, as if you are trying to bust your way out of there! Daddy jokes that you don't quite understand where the exit is, because even now with less than two weeks to go, you are always kicking me so hard in the top part of my belly, and don't seem to see any reason to start moving down! Another funny thing is in all of your ultrasounds, you have been opening your mouth and sticking out your tongue a lot! Dad says maybe you are going to take after mom and have my "gift of gab." During one your 3D ultrasound Jaxon was with us, and he was trying to get you to turn over so we could get a good picture of your face. He was talking to my belly, and you turned over and gave the biggest smile ever! Jaxon can't really understand the 3D pictures and couldn't tell that you were smiling (In fact, after looking at your ultrasound pictures, Jaxon decided that you looked like a "Tiny Warthog") but it absolutely put me over the moon that you smiled at your brother. You two together....I can hardly wait for it!!! 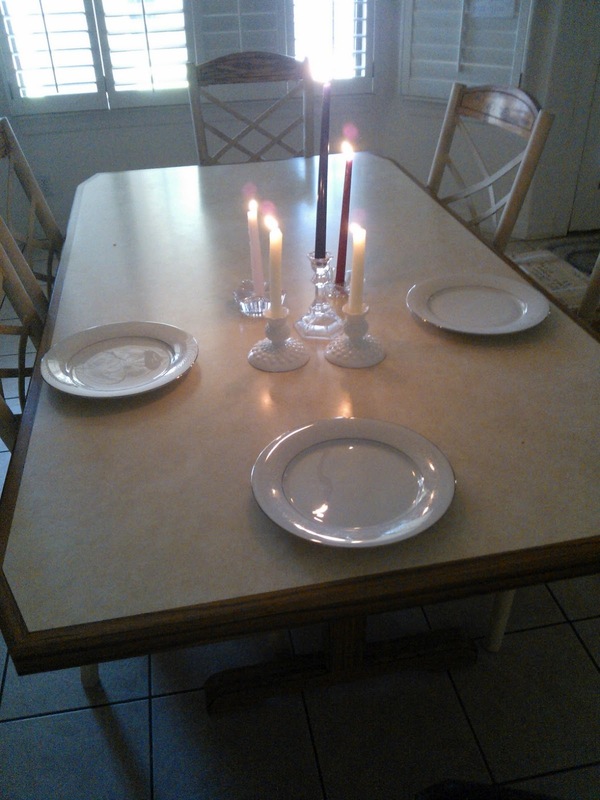 I am so ready for you to get here. Not just because this pregnancy has seemed to be the longest in history, but because we are so excited to meet you and have you join our family. Like I said, probably no one is more excited than your brother, and he already has some gifts for you that he has picked out himself. He is going to be one of the Avengers for Halloween, (Hawkeye) and decided it was only fitting that you be an Avenger as well. You will only be 2 months old, so I told Jaxon I didn't really think that woudl work out, but we got online and found the most darling newborn Captain America costume. Jaxon is SO MUCH MORE excited about your costume than his, and has also decided that mom and and dad will be Avengers too. Dad is going to be...well...I can't remember his name, but he is the boss of all the Avengers, and Mom is going to be (We will see on this one...) Black Widow. That's it for now, but as time grows closer, I will probably write some more. Well hello there little buddy!! I thought now would be a good time to document your growth/progress up to this point, before you make your debut in 2 weeks and 6 days. I'm feeling a little bad because at this point in Jaxon's pregnancy, I had already made a full scrapbook with pictures documenting your/my growth every month, had a different journal/scrapbook made documenting our lives as we prepared for J's arrival, and a bedroom completely decked out in two tone blue paint, matching baby furniture, and darling bedding with frogs! You will not have any scrapbooks waiting, and your bedroom for now is going to be a crib in Grandma and Grandpa Ferrell's food storage room! Don't think it's because we aren't excited. The only other thing we have ever looked forward to this much was Jaxon's birth.... but as indescribable as mine and dad's excitement and pure joy over your impending arrival is....multiply that by about 1000, then multiply it by 1000 more, and you might start to come close to how excited your big brother is!!! Jaxon has been praying for you to come to our family for 4 years now! He has waited a very long time to have a brother, and he is nearly bursting everyday that brings us closer to you joining us! Yesterday I told him that you will be coming on a day that he does not have school, so he will get to come meet you shortly after you are born, and he jumped and squealed for 5 minutes straight- PURE JOY from your big brother! He rubs my belly all the time and tells you he loves you, he can't wait to meet you, he will take care of and protect you, that he can't wait to play with you, and to be good and keep growing! He asks at least 20 different questions a day about the things that he will be allowed to do with/for you. Like "Can I hold Cooper whenever I want?" "When he cries can I help him?" Can I feed him a bottle?" "Will Cooper love me right from the start?" "Will I be his favorite?" "Will you wake me up at night when he cries?" "Can he sleep in my room so I can help him at night when he cries?" "Can he sleep in my bed?" "Can I sleep in his crib?" You get the picture, you have one amazing big brother who is ready to literally smother you with LOVE!!! I was very sick at the beginning of your pregnancy, even sicker than with Jaxon. I was on a home IV and a zofran pump in my belly, all while trying to keep you a secret for a few more weeks and fulfill my responsibilities as Relief Society president....it was no small feat buddy! We quickly decided it would be better just to let everyone know that you were coming, even if it was a little early to tell. We were too excited, and I was too sick to keep you a secret any longer. "Jaxon, we have a really big surprise for you!" "Are we going to Disneyland???" "Nope, even better! MOM has a big surprise for you..."
ARE WE HAVING A BABY? DO YOU HAVE A BABY IN YOUR BELLY? IS THERE A BABY IN THERE?" "Yes! You are going to be a big brother!!!!" I have never seen Jaxon so excited and full of pure joy as the day we told him that you would be joining our family. And from that day, he has been planning for your arrival with all the gusto a 6 year old can gather! We then let Jaxon call Grandma and Grandpa Ferrell on Skype to tell them the great news! We had just been to visit them only a few weeks earlier in China, and we didn't even know we were already pregnant with you! I was not sick yet while we were in China, thank goodness! So G & G had no idea! We called them and Jaxon said, "Guess what? I'm going to be a big brother!" Grandma said, "What? It sounded like you said you were going to be a big brother?" Jaxon said, "I AM! MY MOM HAS A BABY IN HER BELLY!!!" G & G both looked at Daddy and I on Skype with slightly amused faces as if to say, "okay, what is really going on here?" We told them it was true, that we were expecting you sometime in August or September and that they would be HOME FROM CHINA TO BE THERE!!!! Talk about emotional! Both G & G were so excited that they started to cry! That confused Jaxon a little so he explained again that WE WERE GOING TO HAVE A BABY! AND THAT IS A GOOD THING!!!! 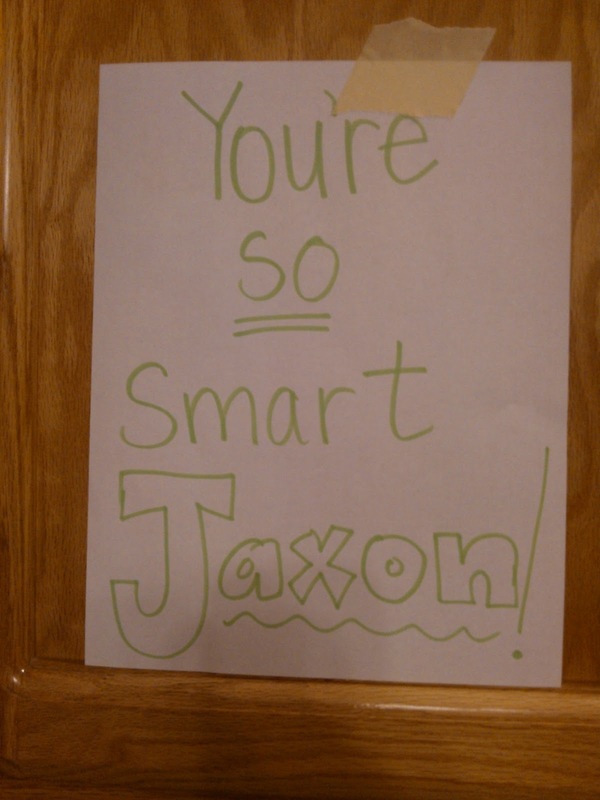 Very Tricky Jaxon, Very Tricky! 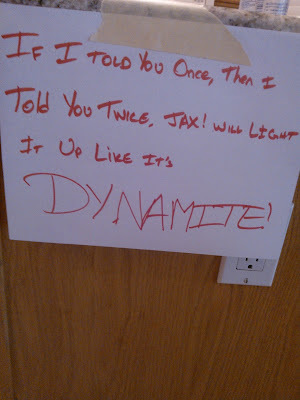 Jaxon just totally pulled a fast one on Dave- and It was hysterical. I hope I can appropriately describe it! Jaxon: Dad, come over here and play Super Heroes with me. We each get one Super power. J:...Oh....I'm sorry Dad. You should come sit on the couch and rest your foot. It would feel a lot better on the couch. D: Thanks buddy, that's sure nice. J: Sit right here dad, just like this...I'll stay over here on this couch so I don't bump it or anything. 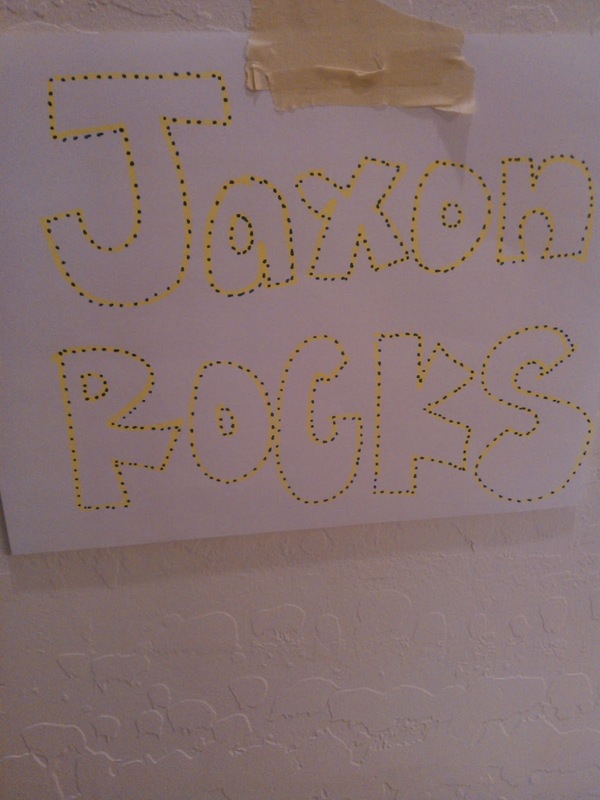 D: Thanks Jaxon, this feels nice. J: NOW....since you're over here... we can play super heroes! We each sit on a different couch and we each have one super power and we play back and forth! "MOM! I'm not getting up, I'm sleeping in until 6:30, BUT GUESS WHAT??? I JUST STARTED A BOOK WITH 8 CHAPTERS!!!" He then ran right back out of the room and didn't come back until 6:45! I am absolutely GIDDY at what this reading time is going to do for his reading skills! THANKS FOR THE IDEA MOM- YOU'RE. A. GENIUS!!!!! When I was a kid, we had our "regular bedtime." But as a "special privilege" if we would behave during the day (somehow this privilege never got taken away...) we were "allowed" to "Stay up" half an hour to read in our beds. MY MOM IS A GENIUS!!! I LOVED this special privilege--- at first because it allowed me to "stay up late" and soon after because I had developed an unquenchable and lifelong love for reading! Like I said... MY MOM, THE GENIUS!!! So this past summer, we instituted "Summer bedtime." Regular bedtime for Jaxon is 7:30, but he if earned it and had a good day, he could stay up until 8. As school was approaching, I knew switching summer bedtime for "reading privileges" would be a perfect swap. We told him what a privilege it is, and that it doesn't involved any playing or messing around or you lose the privilege. Jax was super excited to start and last night was the first night. I left him to his books at 7:30 and at 8 when I went in to turn off the reading light and say goodnight, his head was laying on his pillow and his eyes were closed. He did hear me come in and told me that he "hadn't started another book because he knew he wouldn't be able to finish it in time, and he didn't want to have to start over tomorrow." I also need to insert here, that we have had a rule during the school year that if Jaxon sleeps in until 6:30, rather than his regular 6am (The earliest he is allowed to come out of his room) then he can stay up until 8. "Mom, in the morning, if I wake up, but stay in my room, CAN I PLEASE READ UNTIL 6:30???" "Well, I guess that would be alright..."
"What about at 5:55, can I turn on my lamp at 5:55 instead of 6??? Please??? "No buddy, let's not push our luck..."
"Okay, but if I read until 6:30, then do I still get 8o'clock bedtime and STILL get to read until 8:30??" finally I said, "As long as your not cranky, that would be okay with me." He eyed his Amelia Bedelia book happily and shouted "YESSSSSSSSSSSSS!!!!!" Once again- Dear Mom, you are a genius! I know that if I had presented this as, "As part of being a first grader, you have to stay up and read for 1/2 hour every night, I would have been met with every protest in the book, and here we are...he is begging and thinking of Wiley ways to get more reading time! My mom actually really is a genius, and has a family of 6 smart kids who LOVE to read and are good at it. 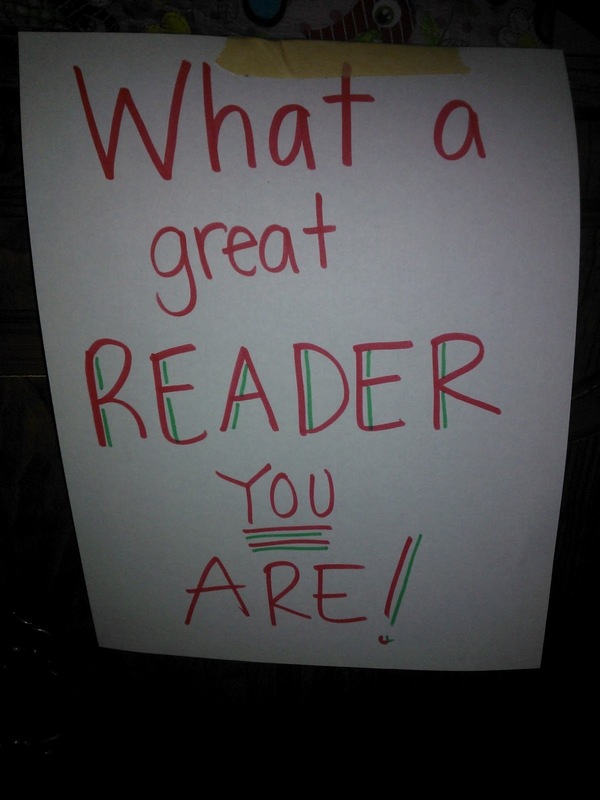 She taught me that to make a better reader, you just HAVE TO READ MORE, and I am loving this new plan. 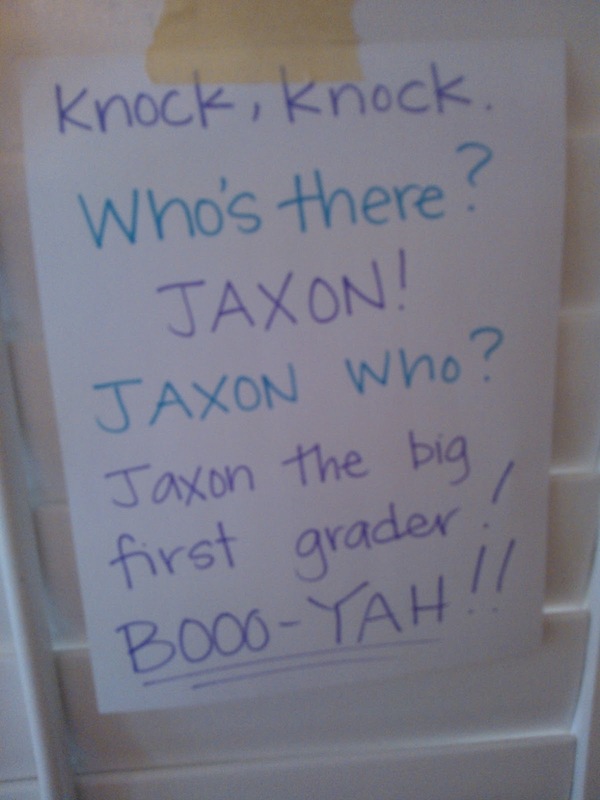 Jaxon still reads out loud to himself, and I stand outside the door and listen occasionally. Not every word is right, but he is a darn good reader for the second day of first grade, and to hear him giggle as he can not only read the words, but comprehend the meaning, and the double meaning, my teacher/mother heart is swelling!!! PS- As I read this post back to myself...it sounds a little braggy. Not only about my genius 6 year old but about my genius mothering skills. While that is not totally the purpose of this post.... I'm thinking to myself...if you can't brag about your only child a little on your blog, THEN WHERE??? Right here, is just right! ~J and tall boy didn't play much besides the before school recess. 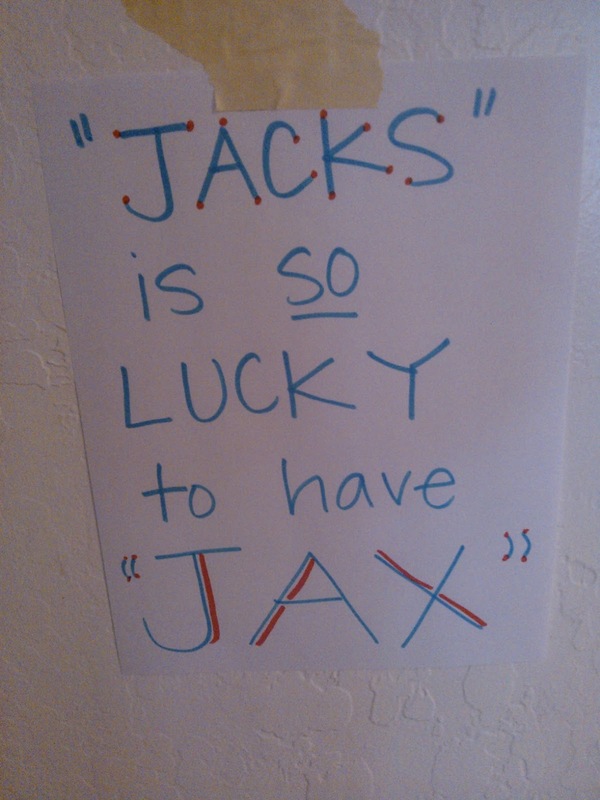 ~Jaxon made, "Lots and lots! So many new friends!" ~They have lunch recess before lunch...so he doesn't actually get to eat until 12:15- YIKES! ~His teacher is "super nice"
~homework today is "So easy!" ~First grade is "SO COOL" because they get 4 recesses (before school, morning recess, lunch recess, and afternoon recess) I concur....that is pretty cool! I asked Jaxon to rate his first day of first grade on a scale of 1-10, and he said "DEFINITELY A 10!!!" Back to school! 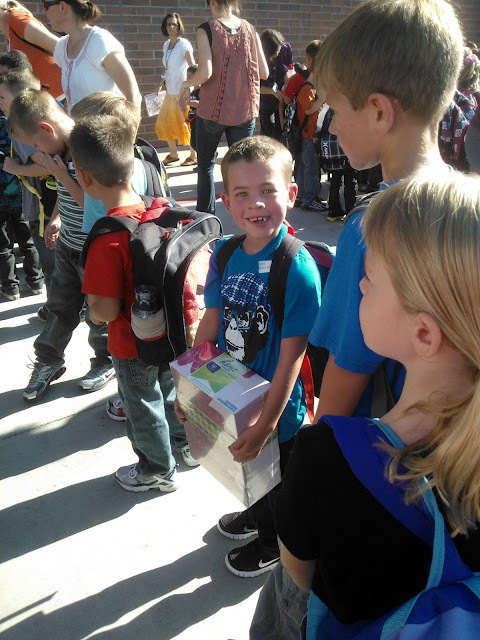 Jaxon- first Grade! This motherhood thing is harder than you might think. 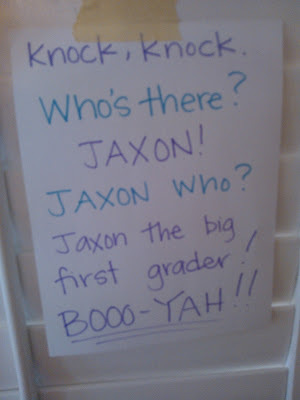 After suffering through a rediculously hot summer being rediculously pregnant and not knowing how exactly to keep Jaxon "intellectually stimulated" most of the time...I thought I was pretty ready to send him to first grade. 1. Jaxon will be gone ALL DAY. ALL DAY?!?!?! 2. I'm no longer going to be the primary adult influence in his life. WHAT??? Who ever decided THAT was a good idea??? 3. In 3.5 weeks I'm going to have a brand new baby at home. I am absolutely SO looking forward to having sweet Cooper here to hold in my arms, to add to our family, to have the second child that we have prayed for for the last 4 years, and to give Jaxon the sibling that he has begged for as long as he could talk...I just remember with Jaxon, the post partum was not pretty. Anyway, It all came crashing down on me this week, and I have spent more than a few evenings with tears in my eyes. Of course never letting Jaxon see anything but extreme excitement for him, but this momma's heart is breaking! The day before school, Jaxon woke up to these signs all around the house for him. He really loves stuff like this, and told Dave and I that he wants them all put up in his room when we take them down from the rest of the house- YES SIR!!! This one by Dave cracks me up! 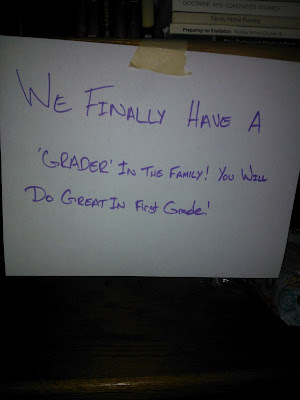 Last year Jaxon told us he couldn't wait to be a "grader" because they are so much better than kindergartners. We asked what he was talking about and he said, "You know! first- GRADER. 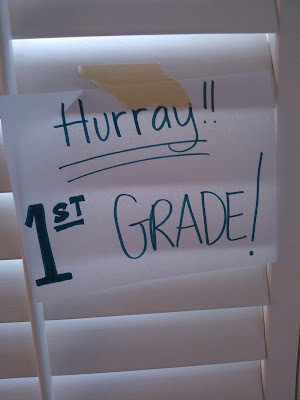 second-GRADER. fifth-GRADER! 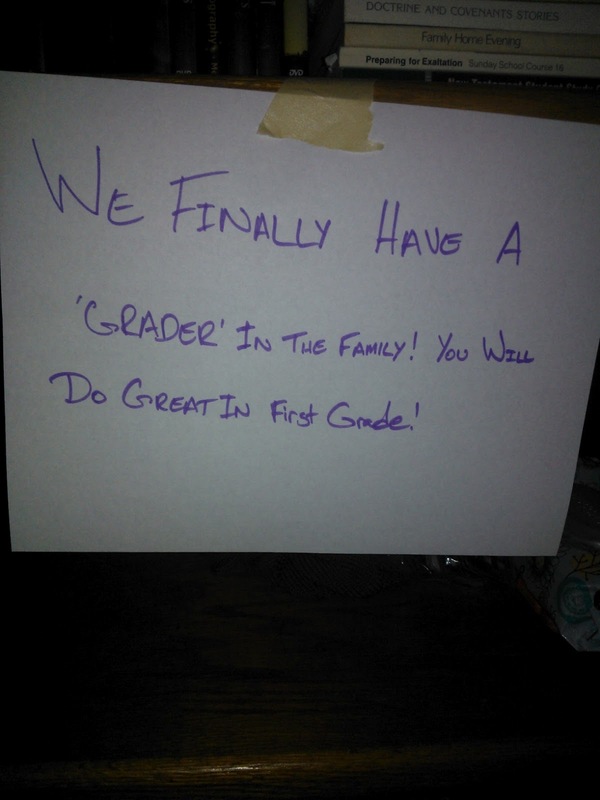 A GRADER!!!" Ah-ha- we got it, and we laugh about it all the time! 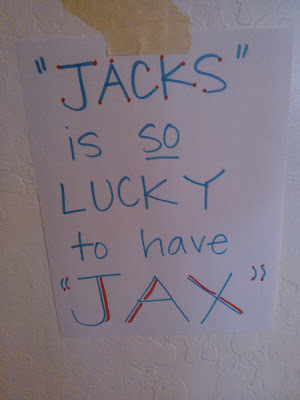 We found out that Jaxon's teacher was going to be "Mrs. Jacks" and he thought that was pretty much the coolest thing ever! 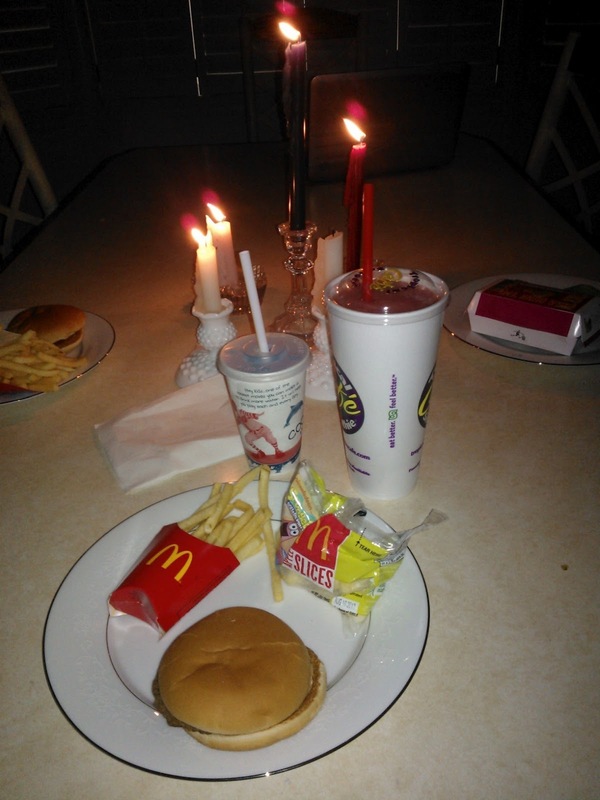 That's right, he chose McDonalds, with a Tropical Smoothie Shake. I hope his taste improves as he gets older!!! 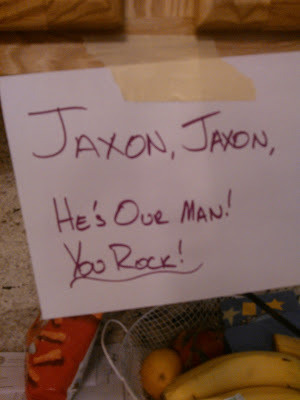 Last night Dave gave both Jaxon and I blessings, and I absolutely LOVE that he can do that for our family. He asked Jaxon if he was nervous about anything, and Jaxon's answer was so spot on with his personality. He said he was only nervous about finding someone to play with on the playground and someone to sit with at lunch, because there were NO boys from his old class in his new class, and only one girl. Not nervous about his teacher, his school work, getting lost at a new campus, learning anything new, reading, NOPE! Just wanting to make sure he has friends. He is such a social boy, and anyone can tell you, his friends/cousins mean the world to him. I always think it is because he doesn't have that sibling relationship to fall back on. Dave gave him a beautiful blessing, and we have also talked about friendship, had Family home evening about friendship, asked others about friendship etc. until we are blue in the face. We want so badly for him to make good uplifting friends who encourage him to chose the right, and vice versa. This morning I tried to pump as much breakfast into him as possible because we leave for school at 7:50 and he doesn't get lunch until noon. For my little "grazer" I imagine the first few days are going to be a little difficult and hunger-filled. He was super excited this morning without any evidence of worry so we hit the ground running. I parked and walked him to the playground, and watched as he walked around looking at all the kids to see if he could find some familiar faces. He found a boy, who I suspect he recognizes from the playground from last year, because he wasn't in Jaxon's class. They realized they are in the same class this year (they are all wearing stickers this first week to help get everyone to the right grade/teacher at the new campus) and stuck together like glue. He seems like a nice kid, and it just cracks me up, because as you can see in the picture below, Jaxon is on the smaller size for first grade, and his new buddy, the one right behind him, has GOT TO BE the tallest kid in first grade! Seriously, I don't think Jaxon reaches his shoulder! I went to the office to help out up there, and left about 10:30. That's when it him me Jax is gone ALL Day for the rest of his school career, and at least for the next few weeks, I'm coming home to an empty house. I got tears in my eyes and called Dave and then my mom for some moral support and decided I wasn't quite ready to head home yet. I ran some errands, and when I got home, sat straight down to write this blog. As soon as I'm done I have lots of clean-up, laundry, odds and ends that I have put off until this moment, so I will do all of them to keep myself from being able to think about it too much!